Some plants get to stay but some just have to go and they take the most work. To the right of the brick walk to the side door, is a garden bed with a compressor for the heat pump. We had to put it somewhere. 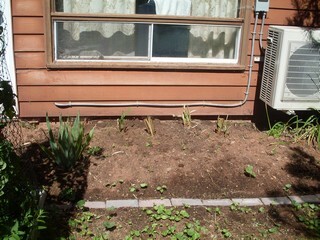 I dug up the somewhat overgrown daylilies and replanted divisions. 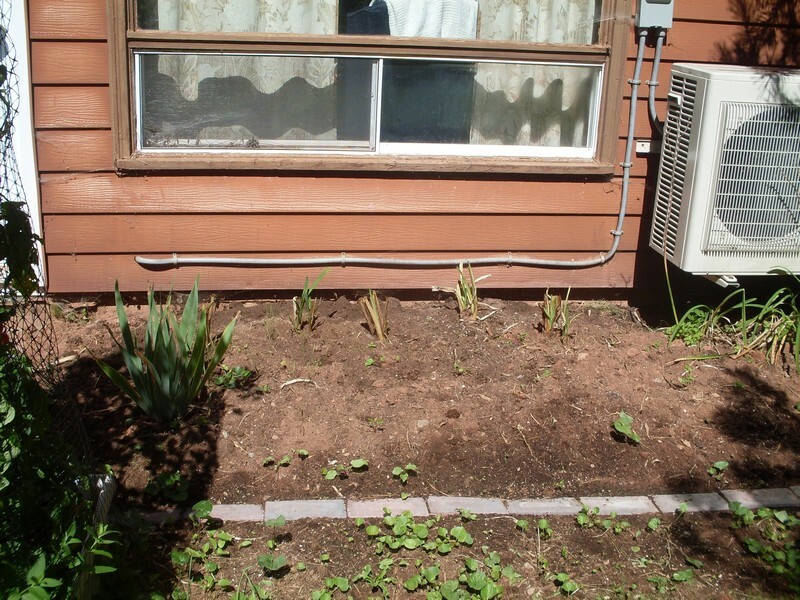 To the left is an iris that is in its second year and doing well. Irises tend to have spectacular blossoms and foliage that stays well through the seasons. In the front of the compressor is a bleeding heart that has died back for the season. It has been moved about four times in the last six years and is doing well in what we hope is its permanent home. With some thought in mind as to what to do to the front bed I proceed to attack the west corner to the right of the front door. 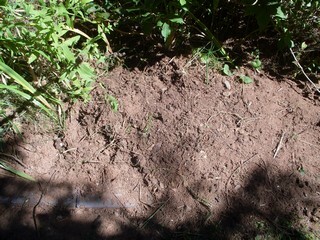 With the exception of the wegilias I will likely dig up everything and replant as I go or as I see fit. 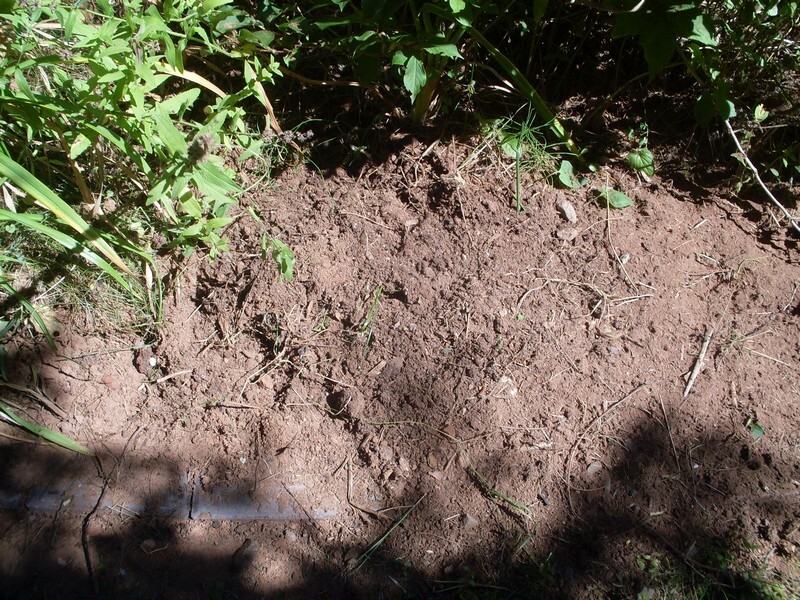 There are some things I want to dig up by the root and dispose of in the compost or for that matter the recycle garbage. For instance, this is a section of wild rose. It spreads rapidly by shooting out roots in all directions and rooting from the nodes. In addition, the blooms of this one are small and uninteresting. 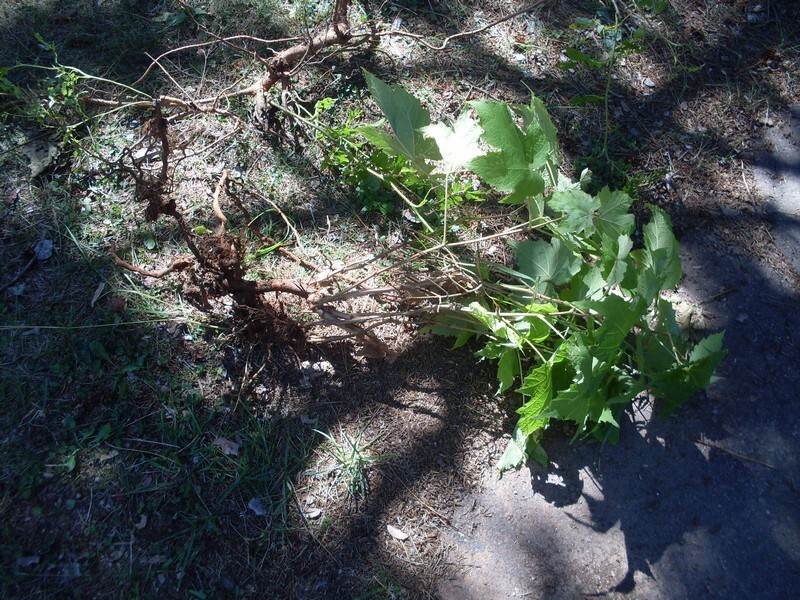 The thorns are not my friend although they tend to be very small and more an annoyance than really painful. This is prevalent in this corner and needs to be removed down to the root level. This will be removed to the recycle where it can go through the municipal program and not coming back. More of the wild rose. 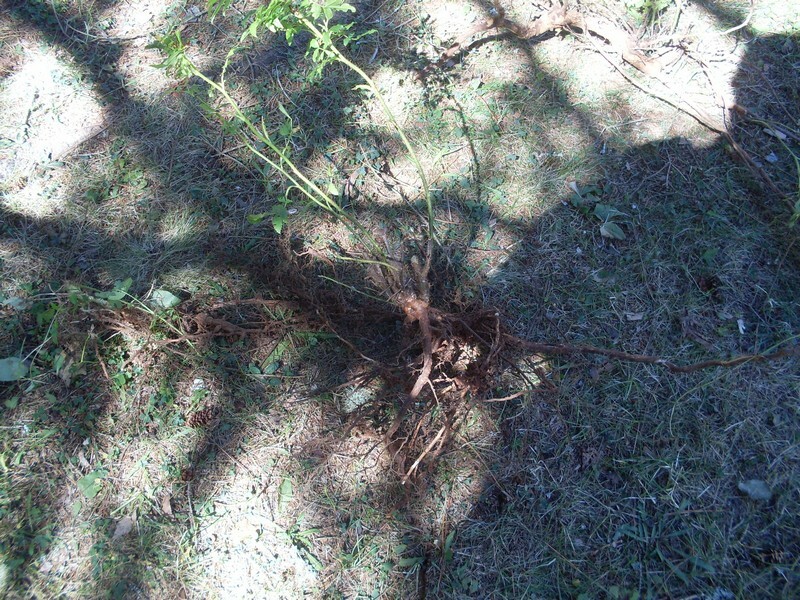 The roots are close to three feet long and are likely to root another plant about every three inches. Out it goes. I will likely not get all of it but it is worth a try. I think of this as common mallow but I am not sure. Common mallow is supposed to be an annual, especially here where we get winters that go down to -20ºC and sometimes to -30ºC. Cold, cold, cold, cold, cold. 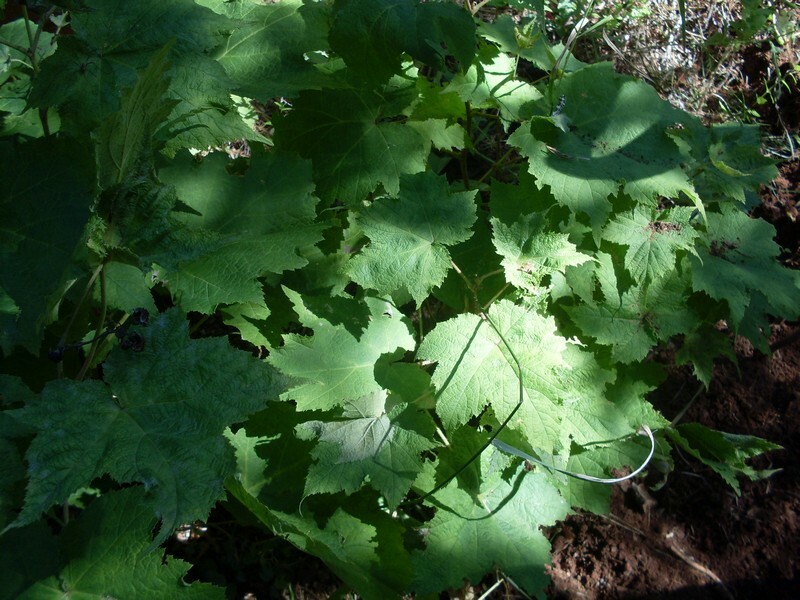 This one, however, is perennial, invasive, and a pain. 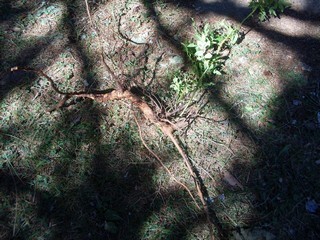 The roots are deep and it appears to be able to propagate by rooting all along the root, rooting from a branch that touches the ground, and by seeds. One tough plant. It needs to be completely dug up and the plant and root into the recycle bin. The only thing that will likely truely dispose of it is an herbicide but I would rather sweat than use it. Personal preference. In this picture of its extensive root system you can see the main plant of this clump and a couple of inches along another green shoot where it has begun to grow a child plant. Incidentally, this clump is an offshoot of a larger mother plant.